From the mountains to the fjords, Norway is a land of stark contrasts. It is a world where sleek, modern style blends with century-old Norse design. Where untamed landscapes envelop pristine cosmopolitan cities, and the cordial descendants of ruthless warriors carry the legacies of adventure and harmony in nature. Boasting four UNESCO World Heritage sites, five national parks and several of the world’s highest waterfalls, Norway’s natural beauty is unrivaled. 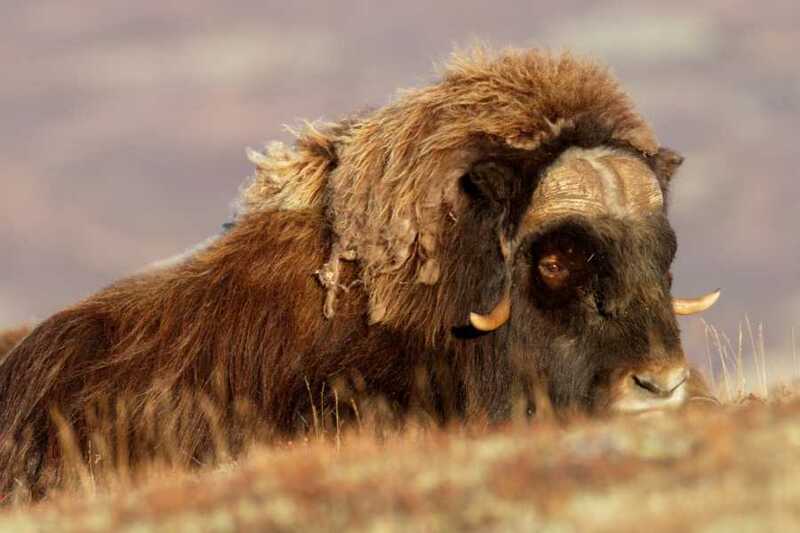 Beginning with the majestic National Park of Dovre, where we might meet musk ox and wild reindeer, we make our way through the mountain plateau, through the steep valleys and down to the fjords. 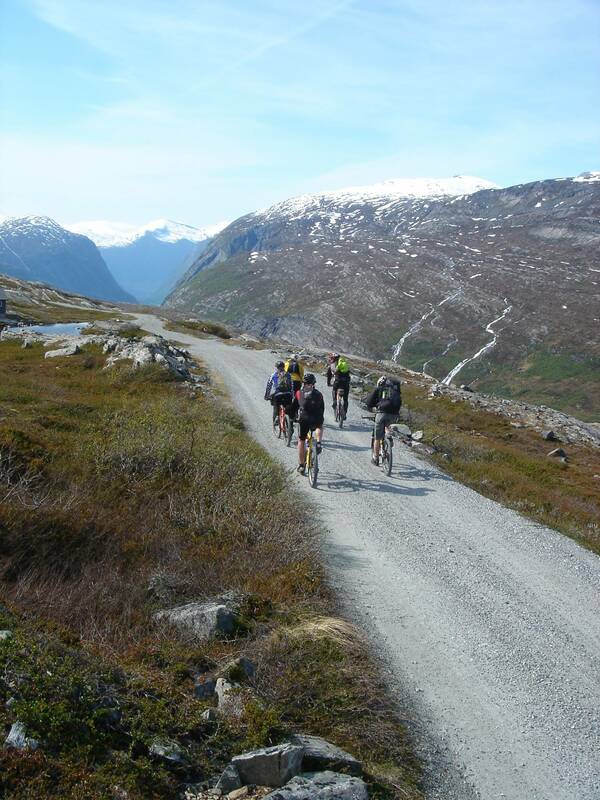 We will travel with bikes, hiking and rafting, and in this compact area with as little driving as possible all the way to the water’s edge discovering why the Norwegian word for folktale, “eventyr,” is derived from Latin for “adventure”. Our starting point is the Dombås train station, approx 4-1/2 hour train journey from Oslo. From here we will have a short transfer up to the mountain plateau and Dovre National Park, home to Europe’s last wild reindeer herds. 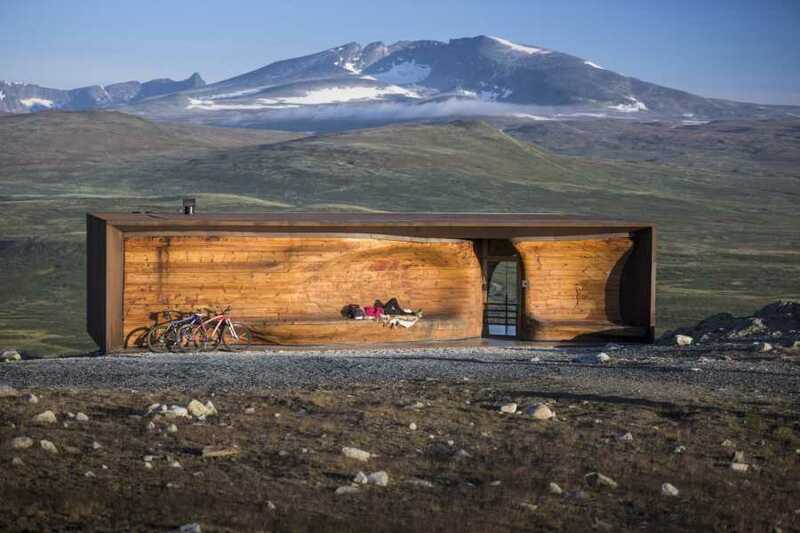 We make a short stop at the Wild Reindeer Center with its internationally-recognized Snohetta architecture. After our visit, it’s only 45 minutes to Oppdal, where we check into our hotel for the evening and meet for our briefing and late dinner. Meeting point at Dombås train station. Note: We can assist with lodging in Oslo and the train transfer from Oslo to Dombås (not included in the tour price). We begin our first day of activity after breakfast. Our guide meets us at 9:00 where we begin our hike from the hotel, walking through town to reach our trail to Almanjbergjet Opp. With an immediate ascent, the hike to the summit is a local favorite and excellent introduction to the typically steep hikes of Norway. The first two hours climb modestly on a nice path through woods and open terrain. The final hour is above treeline and quite steep (we may use ropes if necessary). 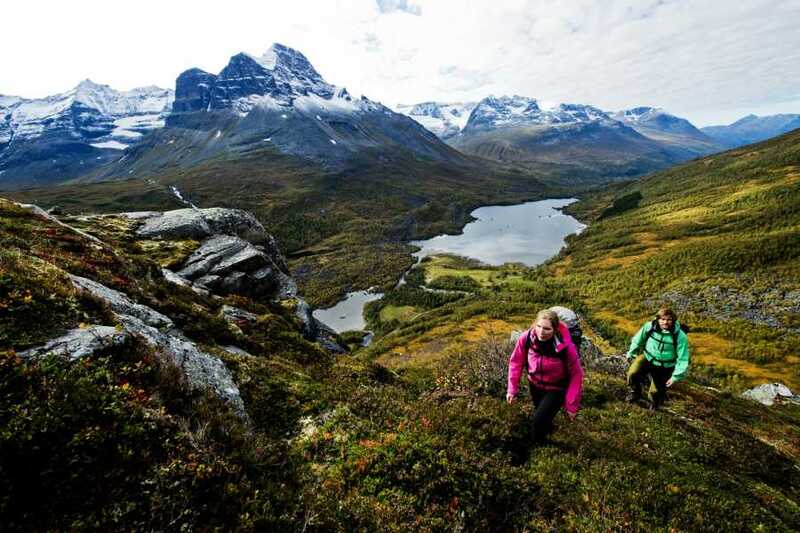 At the summit, we can take in the panoramic views of the Trollheimen Mountains and Dovre National Park as we break for a typical Norwegian lunch of fresh bread, meats, cheeses, fruits, and vegetables that we prepared at breakfast. After summiting, we return by alternate, gentler route back to the village. Today we raft the Class III and IV waters of the Driva River with Opplev Oppdal, an operator of rafting trips for more than 20 years. In a country of fantastic salmon and trout fishing, the Driva River is famous. The trip gets off to a quiet start as we meander through the narrow canyon. 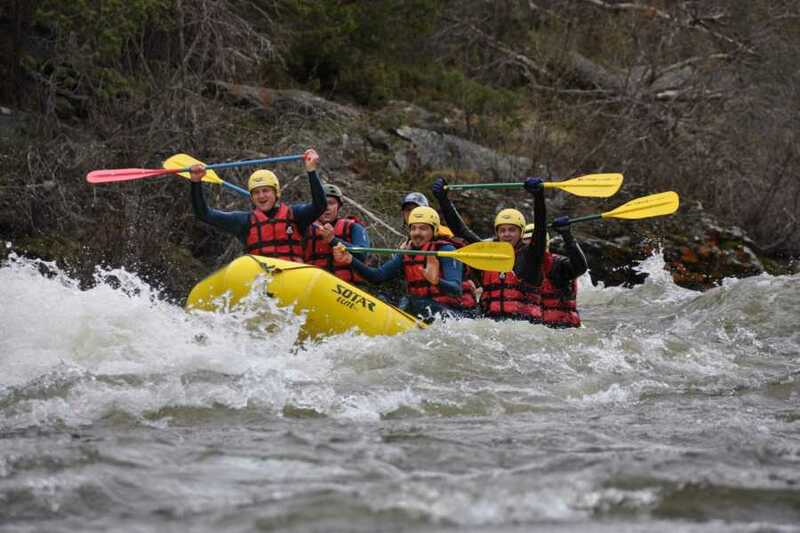 Soon the waters change as we enter a series of 11 named rapids--Hakke, Ålmadroppet, Gammastryka, Bruhølen, Gydasteinen and Fliphølen—over an eight-mile section of the river. There are a few spots where we can cliff jump from large rocks into deep holes in the river. After a leisurely morning, we travel through the Nordmøre Wilderness, with narrow valleys and sheltered grain farms to Sunndalsøra. 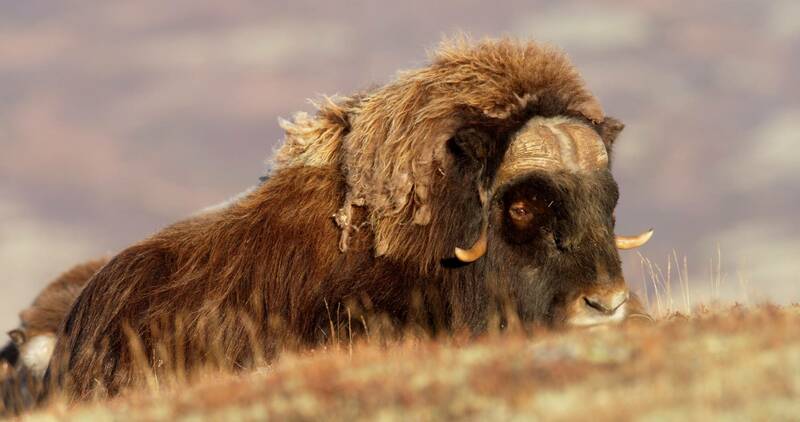 We stop en route for cultural highlights, which may include Småbruket, a local farm where they grow more than 150 different herbs and the visitor center for Dovre and Sunndal National Parks. We also take a short hike to view the famous Åmotan waterfall. With steep cliffs, moraines, and terraces formed during the last ice age, Åmotan is a fan-shaped river system where seven rivers meet. Three of the rivers come together to form the magnificent waterfalls. The hike down is relatively steep, but the waterfall is spectacular and well worth the effort. We break for lunch at a local family farm to taste home-made Norwegian waffles and brown cheese served at the farmhouse dating to 1767. Afterward, we continue our journey through the Norwegian countryside to Sunndalsøra. After a great breakfast, we are ready to begin our two-day bike journey on the Aursjøroad road. 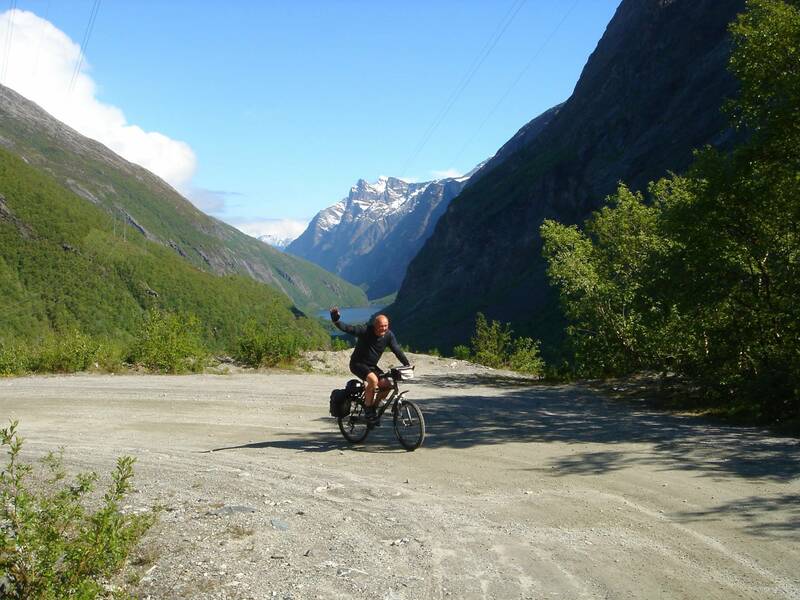 We start with the visitor center to watch a short movie about the bike route that we embark upon the same morning and continue with a thousand-foot climb up Litldalen Valley. As we climb the valley, we will have views of the mountains that are used by base jumpers to our left and the peaceful valley with its meandering rivers and calm lakes to the right. We enjoy lunch by one of the many mountain lakes that we pass along the route before entering Dovre and Sunndal National Park. Starting from sea level this morning at the fjord, we finish the day at Aursjøhytta cabin at 2,838 feet along the western part of the Dovre massif! 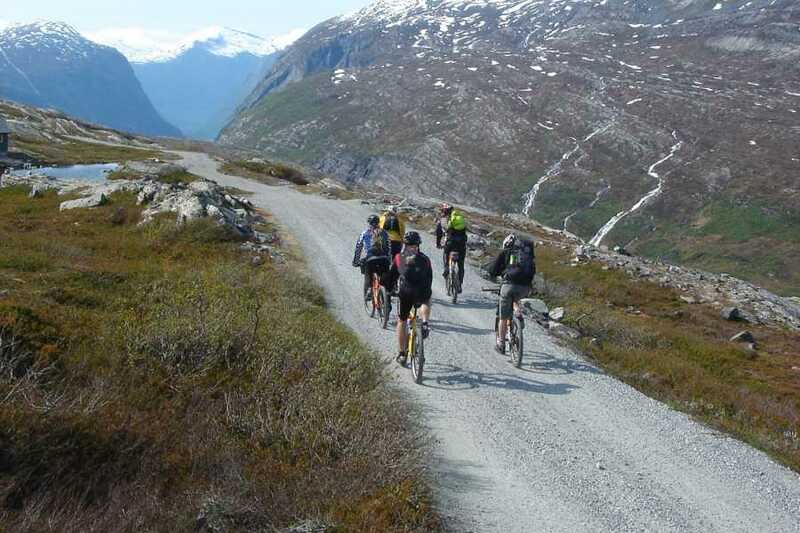 With its rounded, gentle peaks, the surrounding tableland offers pleasant biking with views of the Eikesdalen and Sunndalen-Litledalen valleys below. The reward for yesterday’s ride comes in the form of the descent today into the Eikesdalen valley. We stop frequently to appreciate the breathtaking views and for a few interesting stops…possibly a reindeer crossing or two. 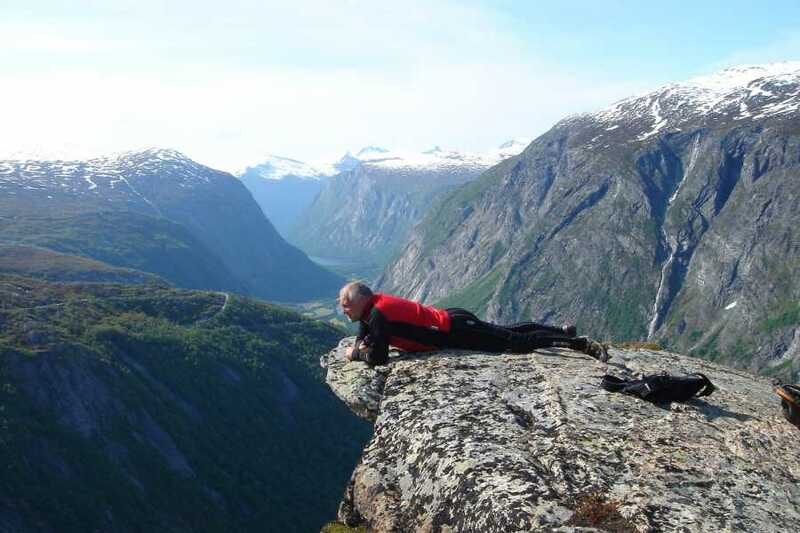 We stop at Aurstaupet, one of the famous take-offs for base jumpers. We have time for a “bath” (bring a swimsuit) in a jettegryte, a “giant’s pot” created by water, a massive rock and thousands of years. Upon arrival in Eikesdalen (population 85) we marvel at the Mardalsfossen, fourth largest waterfall in the world at 2,160 feet high. 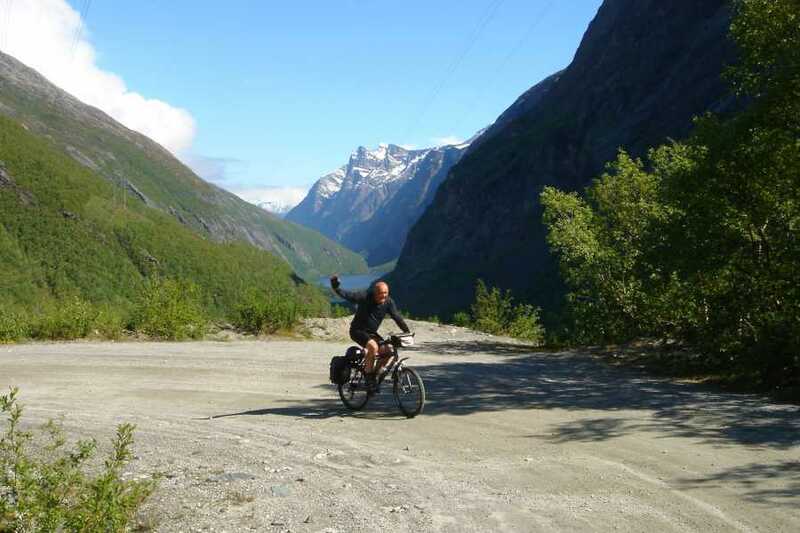 The descent to Eikesdalen is very steep so we ride very carefully into the turns. 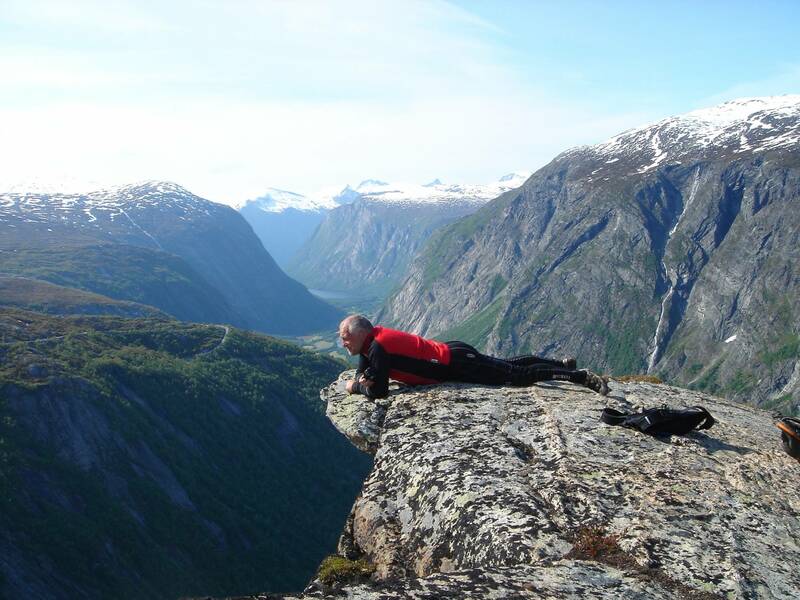 We break near Eikesdalen to enjoy the views of Mardalsfossen, and the lake encompassed by mountain peaks. 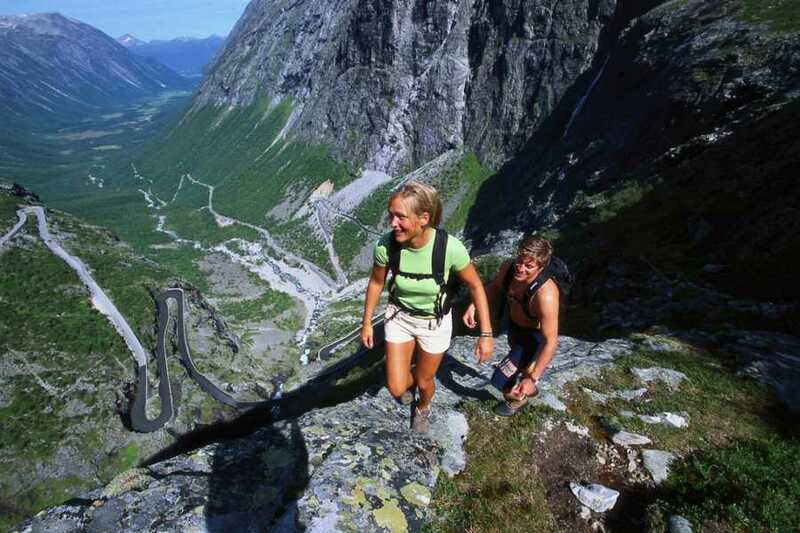 The final 12.5 miles from Eikesdalen to Eresfjord is flat and follows the shoreline of Lake Eikesdalsvatnet. The train ride today to Oslo takes about 5-1/2 hours. The 71-mile stretch from Åndalsnes to Dombås on the Rauma Line, Raumabanen, is considered the most beautiful train ride in all of Norway, and recently ranked by Lonely Planet as the best scenic rail trip in Europe. We will have time to reflect on our incredible journey as we absorb the spectacular scenery along the way.  If you are connecting by plane, please do not schedule a flight before 4:00 p.m. Oslo is a great city, and worth an extra night if you prefer taking a flight out in the morning. 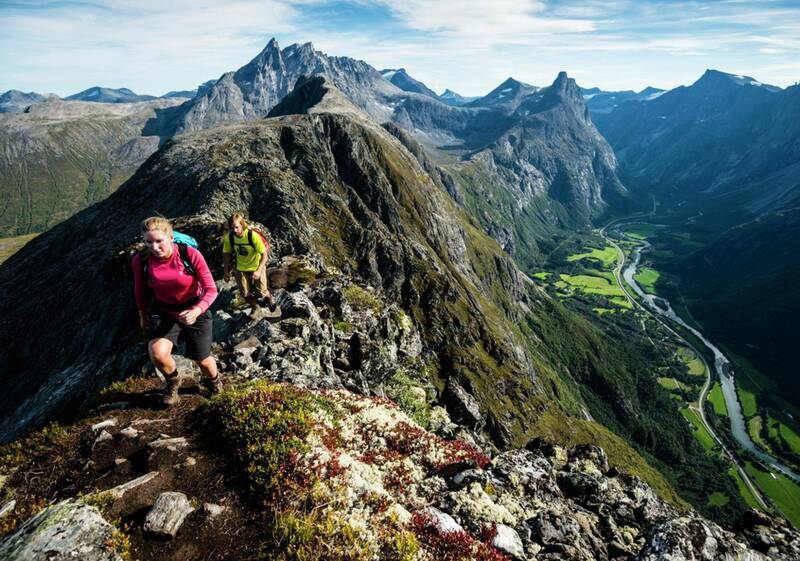 A real multisport adventure in Fjord Norway, including the mountain plateau! - off the beaten track!